Bring out the castanets and wake up the opera singers: on Sunday, Spain and Italy will step onto Vienna’s Ernst Happel stadium ready to dance, and it will surely be a very hot-blooded affair. Two teams with common linguistical heritage but radically different styles of play, the Azzurri and La Furia Roja have also arrived at Euro 2008′s Quarter-Finals following opposite routes. Italy (as we all know) had a very rocky start in its first two games vs. Netherlands and vs. Romania, but finally picked up the pace vs. France thus grabbing second spot in group C on the last matchday. Spain on the other hand comfortably qualified for the next round on matchday 2, and could even afford to field its reserve team in the final match vs. Greece (winning it with a score of 2-1). Compared to the Italians therefore, the Spaniards have enjoyed an additional 2-3 days of rest in order to prepare for Sunday, and also have the added advantage of not having any injured/suspended players. Rest however, did not help the Netherlands much vs. Russia today and teams should always be careful in starting too strongly in a competition. Indeed, if there is one thing that can be said of each of the current Euro 2008 Semi-finalists (Germany, Turkey, and Russia) is that all of them have lost one match in the group stage. So the question is: will Spain break this trend by being the first Semi-Finalist with a perfect record, or will Italy be the 4th team to complete this “we’re not perfect but we get the job done” picture? 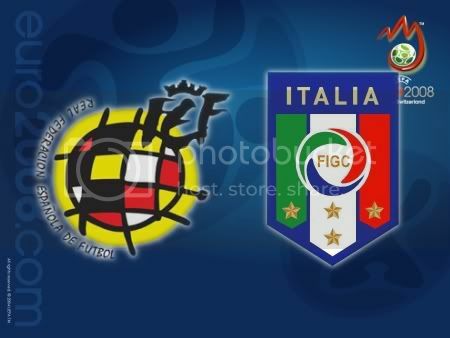 • Competitive meetings between the two southern European giants have been few and far between, but Spain have yet to beat Italy in five attempts. • The most high-profile encounter took place at the 1994 World Cup, where Italy controversially won 2-1 in Boston courtesy of a late winning goal from star player Roberto Baggio. For the Spaniards however, that match is mostly remembered due to an in-game incident (not seen by the referee) during which Italian defender Mauro Tassotti elbowed Spanish midfielder Luis Enrique, fracturing his nose. Tassotti received an 8-match ban for his infraction, but at that point Spain were already out of the tournament and couldn’t care less. • Gianluca Vialli scored the only goal of the game when the two teams last met at the EURO Championship finals, in 1988 at Frankfurt’s Waldstadion. 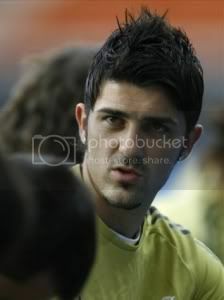 • The most recent encounter ended 1-0 for Spain in Elche on 26.03.2008 (full report here on mCalcio) thanks to substitute David Villa’s goal twelve minutes from time. The previous meeting took place on 28.04.2004, with Fernando Torres opening the scoring for Spain and Christian Vieri equalising for Italy. • Spain have not beaten Italy in a competitive match since the 1920 Antwerp Olympics in Belgium. That was 88 years ago. (From Gazzetta and La Repubblica ): The “Alberto Aquilani” stock is on the rise again at Casa Azzurri. Early reports (from the closed doors training session of Saturday) initially seemed to suggest that, despite Andrea Pirlo’s one match of suspension, the Roma midfielder would once again miss out on playing a lead role at Euro 2008. This in spite of the fact that on paper, and among the roster of 23 players available to coach Roberto Donadoni (well, 22 players now after Andrea Barzagli’s injury), Aquilani is the one with skills & playing characteristics closest to the AC Milan playmaker: accurate and unpredictable passing ability, great ball control, and a fairly good capacity at interdiction. In other words (and much to Donadoni’s habit): we shall see later. Tactically however, Italy’s midfield should be the only real issue left for the anti-Spain line-up. With the now fully estblished Zambrotta-Chiellini-Panucci-Grosso backline (not that there are many alternatives) and the likely confirmation of the Cassano-Toni duo up front, the Italian coach can focus on deciding who to pick in the middle. The likely certainties: Daniele De Rossi (who has probably clinched a starting spot till the end, should Italy advance) and Massimo Ambrosini (a natural substitute for suspended Gennaro Gattuso). Simone Perrotta, whose work against France in an offensive playmaking role was appreciated by Donadoni, should also likely be confirmed. So it basically comes down to that third central midfielder role: Aquilani or Camoranesi? Odds are Donadoni will be pointing towards the former.. But speaking of Donadoni, who knows how many times he must have relived his Azzurri adventure during these 2-3 weeks of Euro 2008. It is a journey to which the Italian coach has given “body and soul” as he says, and now has a great chance to show everyone what he is made of. After the match against France, his dream is play matador against Spain (matar means “to kill” in Spanish) but to do that, he will need a determination that has never been seen before. “Spain,” Donadoni explained in his Saturday press conference, “are a strong team with great individual players. They have excellent players who haven’t achieved the same results in the national side as with their respective clubs. That’s why they will be very hungry to win.” These words have a logical conclusion: “We need to play with the same will they have and we must be as hungry to win as they are.” Thus, it will be necessary to focus. It will be necessary to pay very close attention and play well. Above all: it will be necessary to score. (From La Repubblica and Goal.com): Luis Aragones’ men are on fire: roaring into the last eight after finishing top of Group D with maximum points, the Spaniards have scored 8 goals in 3 games and will go into this match as many people’s favourites to progress to the semi-finals. On top of their good start to Euro 2008, Spain have also won all seven of their fixtures this year, including pre-Euro warm-up wins against France, USA, Peru, and Italy themselves. However, while Spain are certainly in better form than Italy, they have a dreadful competitive record against their opponents whom they have not managed to beat since the 1920 Summer Olympics at Antwerp. Also, Spain’s very good Euro 2008 debut bears the inevitable question: “will Spain once again flop when it really matters“? We have seen this scenario so many times in the past where La Selección have made a flying start to a major tournament, only to then lose their nerve once it gets to a big knockout game. This was the case at the last World Cup, when the team played some delightful football in the group stages, only to then lose 3-1 to France in the second round. Tactically, before the tournament began Spain coach Luis Aragonés experimented with 4-1-4-1 in an attempt to squeeze all his midfield talent on to the pitch, but later settled on a 4-1-3-2 formation. Spain’s recent performances indicate this was a good choice. 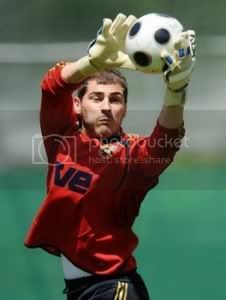 Keeper Iker Casillas sets the tone for a well-drilled unit where Carles Puyol is the inspirational presence. He is a great reader of the game and massively committed but he and partner Carlos Marchena can expect an aerial examination from Luca Toni. Spain have an embarrassment of riches in midfield with half a dozen fast-moving, neat-passing players who are virtually interchangeable. Marcos Senna is a crafty interdictor for Spain who offers a mobile screen in front of the back four, though Xabi Alonso is pressing for a place after an excellent display against Greece. Finally, Spain have a very mobile front duo in David Villa (4 goals from 2 games so far) and Fernando Torres, two players complementing each other perfectly: Torres is the athlete who passes defenders with ease and can hit the byline like a winger, while Villa is more of a predator but also dangerous with free kicks. To mark the importance of Sunday’s match vs. Italy (not only in sporting terms but also political) Spain’s own king Juan Carlos will be attending, accompanied by his companion Queen Sofia. José Luis Rodríguez Zapatero, the Spanish Prime Minister, also set the tone yesterday when he urged the Spanish team to “break the curse” of its “lack of self-confidence” and predicted his nation’s victory by a score of 3-2. 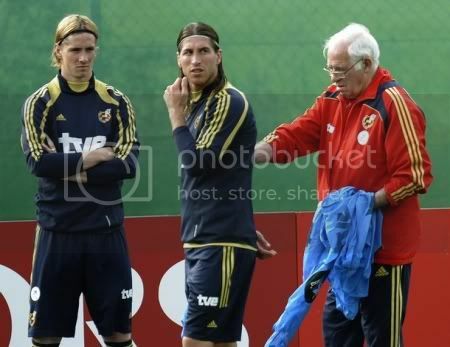 Spain’s players however, despite maintaing their confidence, know this will not be an easy match. “Spain did well in the group stage, but we are nonetheless the underdogs here“. said Real Madrid and Spain goalkeeper Iker Casillas. “Italy are the favorites in light of their football history, and the fact they have reached more finals and won more titles than Spain. Spain have only won one European championship and that was a really long time ago. We must continue with the spirit and play demonstrated so far, because Italy will always be Italy“. Strangely, despite being one of his brothers-in-arms (bad pun intended), Casillas doesn’t rate Gigi Buffon as the number 1 player of the Azzurri (which soon-to-be Juventus teammate Xabi Alonso defined as “one of the best goalkeepers in the world, if not the best”). Instead (and perhaps expectedly, since his job is to prevent the ball from entering the net), he points the finger a Luca Toni, whose goal drought has become an obsession for the Spanish media, deeply convinced that LucaBomber will “wake up” precisely against Spain. “We will have to be very careful on set pieces, because Toni is very tall. If we manage to block him, we will be on the right track to get rid of our quarter-final curse once and for all” concluded the Spanish nº1. 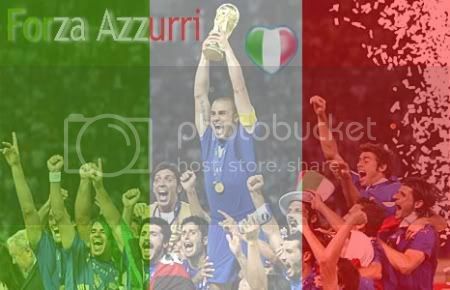 This entry was posted on Saturday, June 21st, 2008 at 9:21 pm	and is filed under Azzurri, Euro 2008, Spanish Liga. You can follow any responses to this entry through the RSS 2.0 feed. Both comments and pings are currently closed.